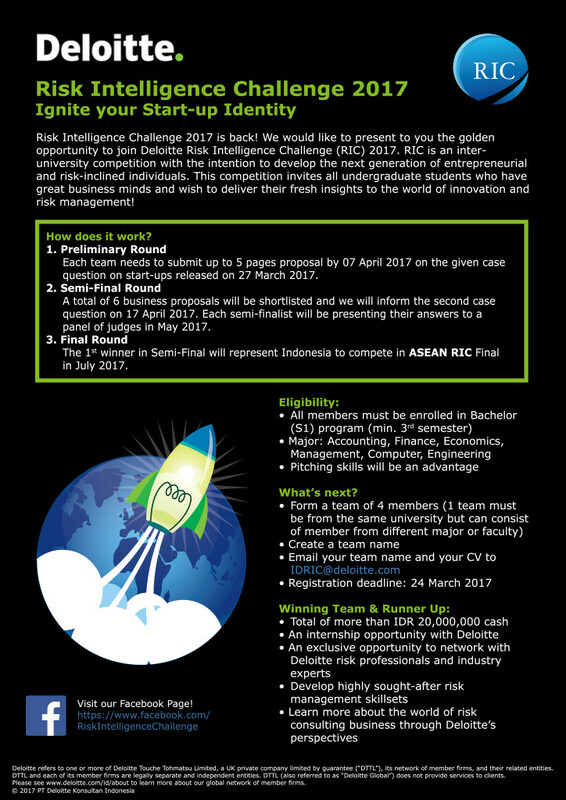 PT Deloitte Konsultan Indonesia invites undergraduate students from Indonesia University to join Risk Intelligence Challenge (RIC) 2017. RIC 2017 is an inter-university competition, with the intention to develop the next generation of entrepreneurial and risk-inclined individuals. This competition invites all undergraduate students who have great business minds and wish to deliver their fresh insights to the world of innovation and risk management. This is a good opportunity because the winner of this competition will represent Indonesia to compete in ASEAN RIC Final in July 2017.